Cité de Carcassonne et ses châteaux sentinelles de montagne is part of the Tentative list of France in order to qualify for inclusion in the World Heritage List. I'm happy to contribute the first review of this area! I visited 7 of the 8 sites across four days October of 2017. The only one I missed was Termes. I came primarily to see the castle ruins, such as the ones nominated here, but there are so many other beautiful natural and historical man-made places to visit that I was thinking this was my new favorite part of France. If you like castle ruins, this is the place for you! They are best visited with your own car, although be prepared for narrow, winding, mountain-side roads with no guard rails between you and a steep drop off. Visiting in the shoulder season was great because it meant very little traffic, and I had a few of the castles to myself. Most of these castles are famous partially through their association with the Cathar, or Albigensian Crusades of the early 1200s. (Neither name is particularly appropriate. They were erroneously thought to be centered around the city of Albi and Cathar is a relatively modern name for them.) A lot of the ruins you visit today are of castles built on the spot of the Cathar-era strongholds that were torn down. The castles then served as border posts against Spain, but that function was rendered moot by the 1659 Treaty of the Pyrennes which fixed the border further south I had never heard of any of this history before visiting the area, and it was very interesting to learn. (I'm omitting Carcasonne itself from this review as it's covered elsewhere as a WHS on its own.) On to the castles! 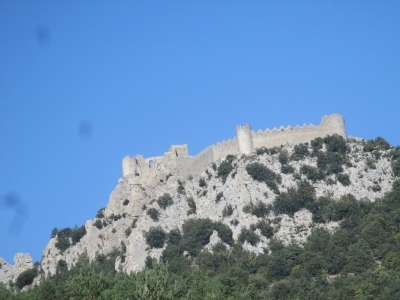 Peyrepertuse is mentioned as a castle as early as 806. The impressive castle ruins stretch out over quite a bit of land over two primary levels. Most of the lower part was built in the 11th century. After the anti-Cathar crusades of the 1200s, King Louis IX (St. Louis) had the higher addition to the castle built, with a donjon (square-ish keep , not a dungeon), chapel, and rock-cut stairs leading to it that are named after him now. It's a 15-20 minute walk uphill from the parking lot. Peyrepertuse is very close to Queribus. Just north of Carcasonne, this site is generally billed as the Four Chateaux of Lastours. Each by itself isn't particularly impressive, at best just a ruined tower with a polygonal wall, but together, it is a great spot to visit and worth the short hike in the hot sun. The fourth and principal castle, Cabaret, is a bit more interesting with its polygonal keep, a square tower and a large curtain wall surrounding the buildings and courtyard. But there are really the ruins of five castles here. Continuing beyond Cabaret's ruins on the site, you can come to the barely visible site of the former village which includes the foundation of an even earlier (and smaller) first Cabaret. There's also a Belvedere from an adjacent hilltop which gives a great view of all 4 castle ruins. This castle is spectacularly set atop an igneous rock peak, a pluton, that stretches up about 200 meters above the village below. The hike up from the castle's parking lot is 700m long, but gains 170m in elevation, definitely the hardest hike of all the castles I visited. This was the last stronghold of the Cathar religious movement. Montsegur held out against 3 different sieges over the decades, but was finally captured after a 9 month siege that ended with a surrender in March of 1244. Over 200 Cathars who had sheltered in the castle and who refused to renounce their faith were burned alive in a field at the base of the peak. The thousand+ year-old ruins of Puilaurens Castle (in the photo above) are perched dramatically on a steep rock outcropping. I was excited to get there once I spotted the impressive fortress while driving up from the small village below. As you hike up the trail, you zig-zag through the ancient defensive chicane leading up to the entrance. The thick stone walls are still relatively intact, with four round towers at the corners of the irregular trapezoid that they enclose. There's also a massive square keep, or donjon. Considering the beautiful clear day I had, this was probably the most impressive of the solitary ruined castles that I visited and it was just superb. There were only a few other visitors there during my visit, and a couple of times I had the whole ruins to myself. Chateau d'Aguilar, one of the "Five Sons of Carcasonne," sits on an picturesque solitary hill that rises 400 feet above the surrounding vineyards. The earliest castle here belonged to a local count in 1021. The ruins you see today include the inner keep built in the 12th century and a six sided outer fortification wall that has turrets at each corner. The outer wall is pretty broken down, but the turrets are definitely still visible. The site also has the remnants of a very small chapel dedicated to St. Anne perched just outside the walls.